The Ojcow National Park (Ojcowski Park Narodowy) is the smallest of Poland’s twenty three national parks but is considered one of the most attractive recreational areas in the country. It is situated just 24 kilometers aways of central Krakow. It was established in 1956 and since then it has been a very popular tourist destination. At present it is estimated that about 400 thousand people visit the Park every year. The Park covers the area of 1440 hectares consisting of an amazing mixture of mountains, forests, rivers, caves, gorges and rocks. There are two historical sites: the castle of Ojców and Pieskowa Skala. The main tourist attraction of the Park are limestone rocks in different shapes. Perhaps the most characteristic is the rock in the shape of a massive club. Due to its distinctive shape it is called Hercules Club (Maczuga Herkulesa). of the river Pradnik valley. In the past the castle served as a residence of royal starosts and it was a major point of the defensive line which passed through the hills of the Krakow-Częstochowa Upland since the Middle Ages to the time of the Swedish “Deluge”. The Pieskowa Skala Castle is a masterpieces of Polish Renaissance palace architecture. It is part of the Eagle Nest Trail- the defensive chain built by King Kazimierz the Great in the middle of XIV century. The Park has also around 400 caves inhabited by 17 species of bats. 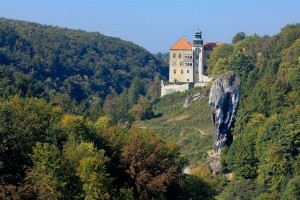 The longest caves are the famous King’s Lokietek Cave (320 m), Ciemna Cave (230 m) and Zbojecka Cave (189 m). If you are staying in Krakow for a few days, it’s well-worth taking a little break from the city, visiting this magical place and exploring the Jurassic landscape in the Ojcow National Park.